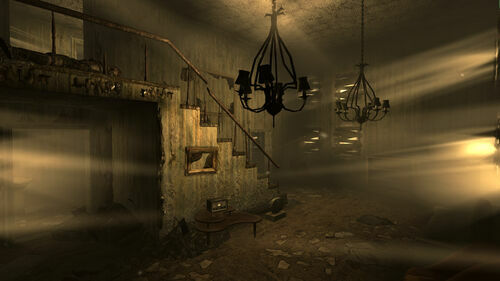 I'd always loved the Gibson house in Minefield, and wished we had an option to live in it; in fact I usually do till I can get my own place. What I liked best was the feel of a regular family house; and basically their structure was intact. (just dungeony). So what I did was basically just stick (a copy of) the Gibson house inside the Megaton house for the exterior so it still fits in with the feel of Megaton (see the last three screenshots on the final link below for the exterior screenshots). The interior is the same as the Gibson house's too. It looked much better, but really didn't like the pink striped wallpaper, or that all the rooms looked exactly the same. I love it! Oh, and also added an upper balcony for some private outdoor relaxation - or some outdoor BBQing!!!! Tables, chairs, benches, some food, etc. Wow, that looks like some serious renovation and upgrading! Thank you so much Acadian !!! I was pretty sure you wouldn't have known what the vanilla Megaton house looked like - or the Gibson house, for that matter - so went ahead and posted a screen of each base I worked with so you would realize the contrast it was from what it had been, lol. The problem in Fallout 3 with any mod being too clean like this one is - there is no water to clean up with in Fallout 3, it is all irradiated; and what little isn't irradiated is so rare that no one would waste it on cleaning; so that makes a clean house feel immersion breaking - too much of a jolt from the rest of the game. That means in order for this mod to work, it has to have some reason for being in pristine condition, some explanation for how it got that way (or stayed that way). The in game examples of pristine/immaculate condition are all connected to Dr. Braun; Vault 101, Vault 112, and Tranquility Lane. Dr. Braun used the power of the Geck to create alternate reality/virtual realms where everything appeared perfect without closer inspection. That is exactly how this mod fits right in with lore. Like Tranquility Lane, it is a virtual realm created by Dr. Braun, but instead of a sleeping pod it IS the pod. The Player has to activate it somehow to gain that virtual realm inside their Megaton home. Like Anchorage, Tranquility Lane was a virtual world one had to be in a pod sleeping to reach - but the world was actually very real, you could die by virtual enemies in both Anchorage and Tranquility Lane - so being a virtual realm is a relative thing. (** There will be no attempts to kill the Player in his home, don't worry, lol). History, and how it fits in to it = Lucas Simms tells the Player the Megaton house was abandoned by its owner, who is never named in game. For the purposes of this mod, the person who owned that house before the Player was Dr. Braun. So the story for the mod would be that Dr. Braun lived in that same Megaton house the Player is given, and it is where Braun developed all the secrets of that virtual realm/mind toying/etc. (that he carried to Tranquility Lane). When your Dad (James) left Vault 101, he went seeking that Geck research that Dr. Braun had to work on Project Purity again like he had left off doing 20 years earlier because of your birth. The very first place your father went looking for Braun was right there in Megaton - remember he was seen by Moriarty, who writes about seeing your Daddy James in Megaton (it's on Moriarty's computer in a journal right after his descriptions of the Megaton residents). Moriarty's computer entry in game says that Daddy James asked Moriarty where he could find someone that knew everything going on in the Wasteland (since he'd been underground in that vault for 20 years, didn't know who to go to for intel) , and Moriarty sent him to see 3 Dog. (Immediately after you reach Megaton, 3 Dog begins announcing having seen "This cat James, good guy!" if you listen to his broadcasts). So in my mod, I'd add a small description of Dr. Braun in with the descriptions of residents as a strange, reclusive scientist that mysteriously abandoned his house suddenly and no one had a clue where he had gone; then I'd change Moriarty's computer entry to read that your Dad was looking for Dr. Braun, and that Moriarty sent Daddy James to 3 Dog who might know). It keeps the main quest flowing correctly, just adds the tidbit about Braun living in the house you get if you fix that bomb. If the Player has not got the house yet, and is beginning a new game, he would get that house and I'd leave a few clues around (like notes written by Braun, I already planned to do that no matter if the Player has started a new game or not). 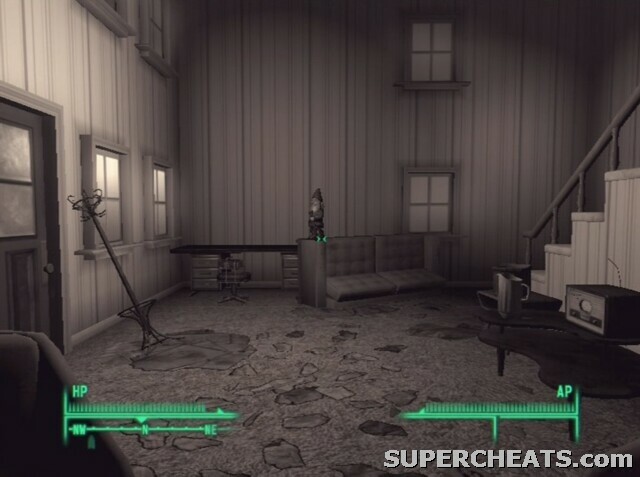 If the Player already owns the Megaton house, then I'd place some notes for them to find that would lead them on a small quest to find a secret button, when they push it they think nothing has happened (till they go home and see that "virtual reality home" - my mod - in their Megaton house) - something like that. Anyway, I'm so glad you liked it Acadian !!! Thank you for stopping in to look at it !!! You're most welcome, and thank you for providing all the info on FO3 as far as how the mod can fit into the game! Edit: After discussing this with mALX, we agreed to move her thread here from the Oblivion Mods forum. Were the thread to offer a Fallout 3 mod, I suppose the General RPG forum might be fine. Her intent here, however is to showcase the efforts of a work in progress via screenshots � which fits nicely right here. That is an ingenious backstory for presenting the house mod, mALX! My first thought when I saw it was that it looked too clean for Megaton, but your backstory makes the reason for this apparent. One thing you might consider is that the purified water in the wasteland is, in fact, purified� meaning that somewhere there is an apparatus for accomplishing that feat. Given that you are able to buy a first aid station and a lab to make chems from Moira, it doesn't strain immersion to believe that a water purification system wouldn't be something that you could just buy. I like the backstory of it being Dr. Braun's house too. Perhaps it had the benefit of being the initial test bed of a prototype GECK? That would also help explain why it looks so spiffy. Thank you so much, SubRosa! Even as I was making that mod, I knew it was not going to be one anyone would want (other than me), but I was learning how to use the Gimp and that was actually my first foray into actually opening up the DDS files and changing them instead of just retexturing meshes. It was really exciting to be able to do that with the DDS files, I actually got that decor from pictures of rooms with crown molding on the internet - it was exciting to learn how to do something new to begin with, but to be able to take a snapshot of a real house and incorporate it into the game was beyond anything I knew was possible in modding. It was a blast, really satisfying that it was something all new to me and it worked - but the whole time I was making it, I kept thinking that there would have to be some story to explain it. Of course that automatically had to point to Dr. Braun, he is connected to all the pristine places in the wasteland, lol. Thank you again, your kind words meant a lot to hear!